Impossible to Win the game? Magician makes two loops with a chain, between two hands. Now the magician asks the spectator to play the game. #1. Ask the spectator to insert their finger into one of the loops. #2. If the chain is tangled up with their finger — It means the spectator WINS the game. #3. If the chain is slipped out of their finger — It means the spectator loses the game. – The old monte trick with chain needs to perform on the table. New ideas & improvements by Nojima & Yamagishi allow you to perform this magic even you’re standing up. – Since the table is NOT necessary to perform this magic, this is perfect for table-hopping. – Nothing will be exposed even 1 inch away. ***As a bonus trick — A great effect “Triple Through” by Nojima is introduced and explained. Magician wraps the chain a few layers around the hand. 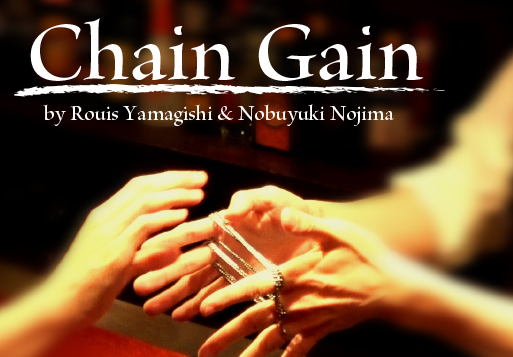 However, the chain instantly escapes from the hand.